This was revealed by Chiefs coach Ernst Middendorp following his side’s 2-1 defeat to Mamelodi Sundowns in an Absa Premiership match at the FNB Stadium on Saturday. 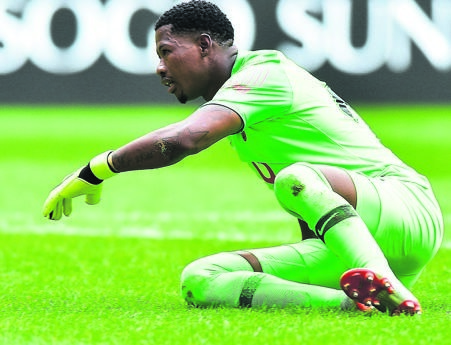 The Bafana Bafana keeper sustained a shoulder injury that forced him to miss Amakhosi’ last two league matches under Middendorp, including their 1-0 win over SuperSport United before the festive season break. Khune watched haplessly from the stands, wearing a brace on his arm, as second choice stopper Virgil Vries made a blunder that allowed Downs striker Lebogang Maboe to score a late winning goal. This was after Willard Katsande had cancelled Anthony Laffor’s opener in the first half. Although Vries produced a solid display against SuperSport, that mistake could haunt him. But Middendorp said they will rally behind the Namibian international, who is expected to be thrown in the deep end again on Wednesday (7.30pm) when Amakhosi tackle log leaders Bidvest Wits at Milpark’s Bidvest Stadium. Chiefs occupy eighth spot and are 12 points behind The Clever Boys on 21 points from 16 matches. Middendorp said he will sharpen his attack that looked a bit rusty in front of goal, to ensure they fire from all cylinders against Wits. He added: “We made little mistakes and lacked decision making. The team showed good behaviour and the right attitude as a lot of stuff we did right. “We have designed a training programme and immediately at our next session we need players into situations where they’ll make right decision movements.